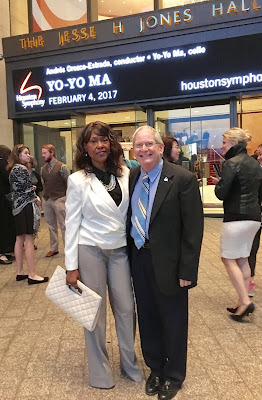 After a great family Thanksgiving for the fetching Mrs. Sheralyn B. and I on Thanksgiving Day, can it get any better than to end this Thanksgiving week with a Houston Symphony Orchestra concert at Jones Hall [Saturday night] featuring the music of two of the greatest composers who ever lived, Mozart and Brahms. Our world class Houston Symphony Orchestra will be led by guest conductor, David Danzmayr. From the HSO website: "Described by The Herald as “extremely good, concise, clear, incisive and expressive,” David Danzmayr is widely regarded as one of the most talented and exciting European conductors of his generation." This is a great program I am looking forward to as it features two of my favorite composers: the quintessential Classical Era Composer, W.A. Mozart [his Piano concerto #22], and the Romantic Era giant, Johannes Brahms [his wonderful 4th symphony], with his melodious rich sound. This from the HSO web site describing the concert: "How glorious it is to behold pure genius at its prime in Mozart’s late, great Piano Concerto No. 22, written during an astoundingly prolific stretch in which the music poured forth as if fully formed. Celebrated pianist Inon Barnatan—“a true poet of the keyboard” (London Evening Standard)—is your soloist. Then, peer through a dazzling kaleidoscope of color with Brahms’ final symphony, whose radiant melodies ebb and flow like a sun-lit river. It’s a program of musical delights, this Thanksgiving with the Houston Symphony." The concert program opens with Franz von Suppe's "Overture to The Beautiful Galatea". As always, whenever my wife and I attend a concert at Jones Hall, I like to share "just a little" from the pieces we will be hearing. So, please turn up your volume and enjoy some great music from the giants, Mozart [piano concerto #22] and Brahms [the melodic allegro non troppo first movement of his final symphony]. Note: Mozart's concerto #22 contains 3 movements: 1. Allegro; 2. Andante [starts at 13:46 in the following video]; and 3. Allegro, featuring a mesmerizing rondo theme [starts at 22:15 in the following video].